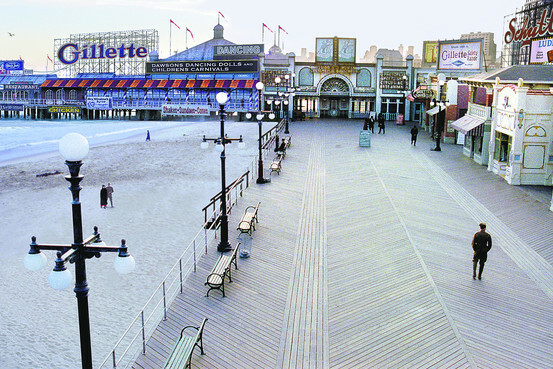 Imagining a 1920’s Atlantic City: VFX in Boardwalk Empire – Ms.M.L.S.K.A. Scorsese’s new HBO series strategically incorporates VFX 3D animation into its big budget set design of Boardwalk Empire. VFX is used to stand in for things like buildings, deer, billboard ads, window reflections and scenic shots of the beach’s horizon from the boardwalk. Months of work/research/design. In a clip on the show’s website, VFX producer Dave Taritero says their biggest challenge was “keeping the seasons correct.” Shooting the pilot during the summer, when the plot has the scene set in the dead of winter, meant turning green trees into a bare snow speckled forest.